There’s an opera called “Aida,” which was written by Giuseppe Verdi more than 100 years ago, but I’m not writing about music today. I’m writing about marketing. 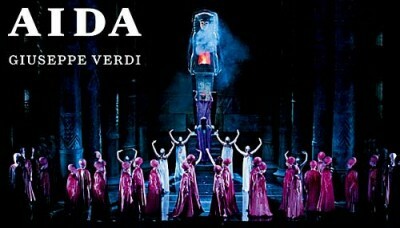 You see, “AIDA” also stands for one of those magic formulas of marketing and advertising. When you’re evaluating your own advertising, AIDA is a great acronym to keep in mind when you want to make sure your marketing is as persuasive as possible. Build DESIRE: Once you’ve grabbed attention and built interest, sell the prospect on why they should really want your product or service. Encourage ACTION: Make your best offer so the prospect actually takes some form of action – either to identify themselves as a lead or make a purchase. Let’s see how this AIDA approach works. 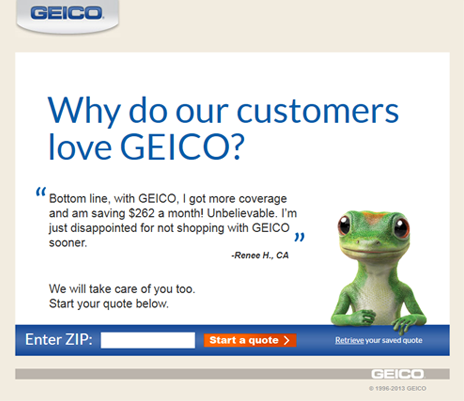 I happened to run across a landing page for GEICO, the company that sells car insurance. They’ve been advertising on television for years so the company already has a significant branding presence based on their amusing gecko character with the British accent. The headline about why customers love Geico enhances reader interest. It’s interesting because most people don’t “love” their auto insurance companies. The testimonial builds desire. It’s about saving money, and who doesn’t want to save money on something like car insurance? Finally, the quote box at the bottom encourages action. It asks you to start the process of getting a quote by entering your Zip Code. Obviously, I don’t know exactly how well this landing page does, but Geico is a successful company (a division of Warren Buffett’s Berkshire Hathaway) that insures millions of cars across the US, so I figure the company has tested a wide variety of landing pages to find out what works and what doesn’t. So there you have it. Just apply a little “AIDA” (the marketing formula, not the opera) to your advertising and see your results perk up. It will bring music to your ears and put money in your pocket.